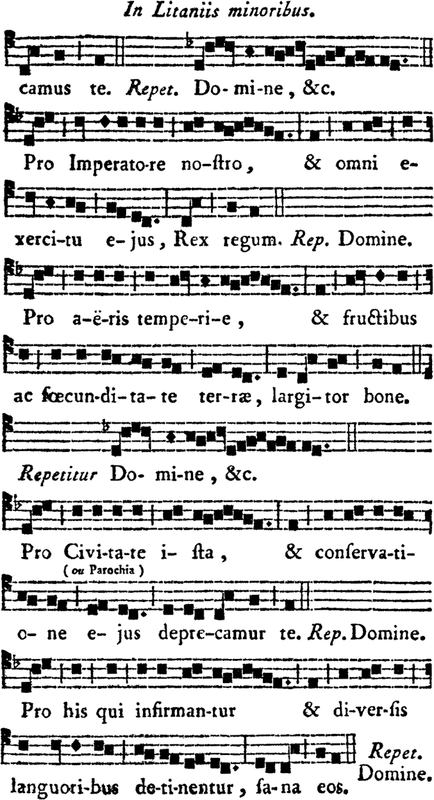 Until the time of the Revolution, and even beyond, to the beginning of the 19th century, some dioceses in France preserved the custom of singing a litany known from its opening words as Dicamus omnes. The ancient character of this text is unmistakable; prayers are offered for the Emperor and the Roman army, which may date it back to the fourth century. This litany is probably one of the very few remnants of the ancient Gallican Rite which survived the suppression of that rite decreed by Pepin the Short and Charlemagne, in favor of the Roman Rite. 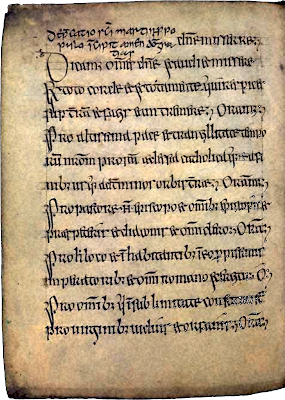 It is known in a similar form in the rites of territories which border that of the Gallican Rite; in the Ambrosian Rite, it is still sung to this day at the beginning of the Masses of the 2nd and 4th Sundays of Lent, and in the ancient Celtic Rite of Ireland, it was sung between the Epistle and Gospel. 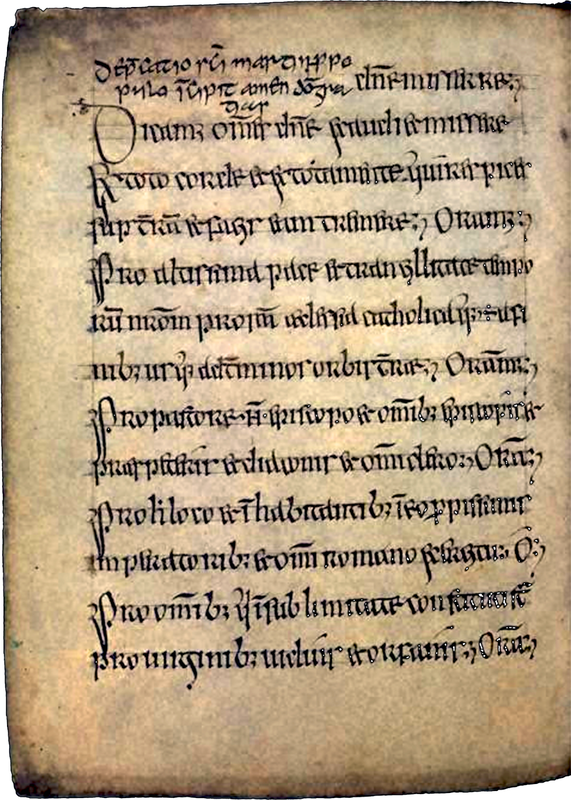 In the most precious witness to the latter, the Stowe Missal (Royal Irish Academy, Dublin; D ii 3, f° 16), which dates to the end of the 8th century, the litany is titled “Deprecatio Sancti Martini pro populo – St Martin’s prayer for the people.” The importation of a Gallican prayer into the Celtic liturgy is explained by the close ties between the monastic practice of Ireland and that observed early on in Gaul, in the time of St Martin. 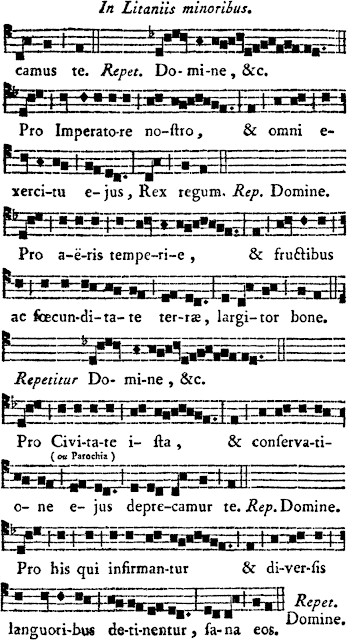 Here is the chant notation for it from the Processional of Laon (Processionale Laudunense), published by Jean-François-Joseph de Rochechouart, bishop and duke of Laon (1755). 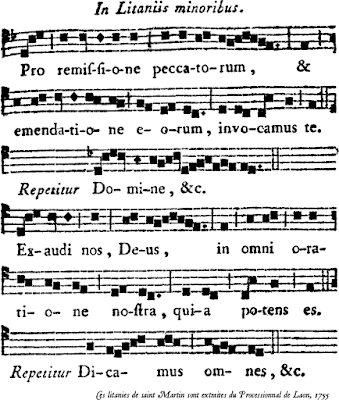 Even in the middle of the 18th century, it preserves all the beauty of the primitive deacon’s chant, in the third mode. The litany was probably originally sung at the beginning of the Mass, like the Great Litany of Peace in the Byzantine Rite, and the Ambrosian Litanies of the Sundays of Lent. 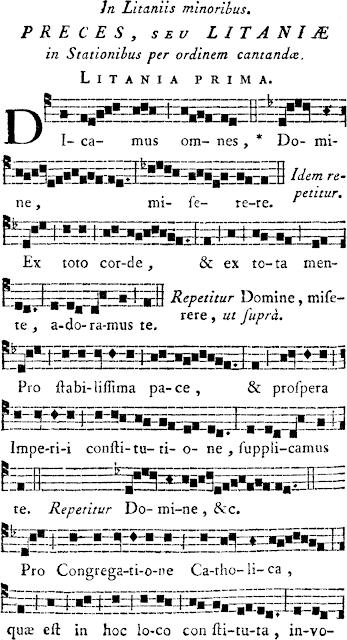 Like certain other texts of the ancient Gallican liturgy, it was able to survive the Carolingian suppression by being incorporated among the chants used on the Rogation Days, which were instituted in Vienne in the 5th century, and from there passed into the Roman Rite. 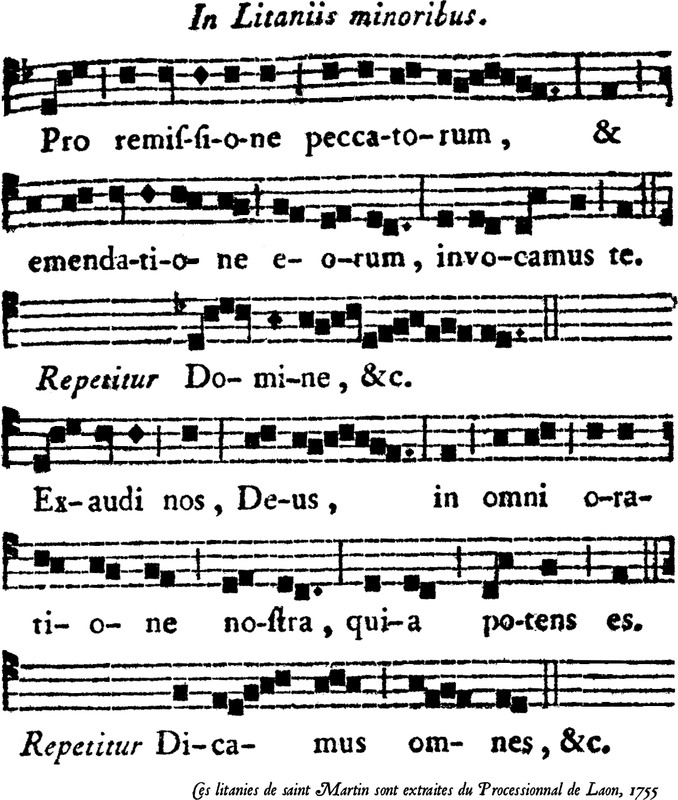 V. Dicamus omnes, Domine, miserere. (Let us all say, Lord have mercy.) R. Domine, miserere. V. Ex toto corde, et ex tota mente, adoramus te. (With all our heart, and all our minds, we worship Thee.) R. Domine, miserere. V. Pro stabilissima pace, et prospera Imperii constitutione, supplicamus te. (For long-lasting peace, and the prosperous condition of the Empire, we beseech Thee.) R. Domine, miserere. V. Pro Congregatione Catholica, quæ est in hoc loco constituta, invocamus te. (For the Catholic Church, which is established in this place, we call upon Thee.) R. Domine, miserere. V. Pro imperatore nostro, et& omni exercitu ejus, Rex regum. (For our emperor, and all his army, o King of Kings.) R. Domine, miserere. V. Pro aëris temperie, et fructibus ac fœcunditate terræ, largitor bone. (For mildness of weather, and the fruits and fertility of the earth, Good Giver.) R. Domine, miserere. V. Pro civitate ista, et conservatione ejus, deprecamur te. (For this city and its preservation, we beseech Thee.) R. Domine, miserere. V. Pro his qui infirmantur et diversis languoribus detinentur, sana eos. (For those who are sick, and detained by various illnesses, heal them.) R. Domine, miserere. V. Pro remissione peccatorum, et emendatione eorum, invocamus te. (For the forgiveness of sins, and the correction of them.) R. Domine, miserere. V. Exaudi nos, Deus, in omni oratione nostra, quia potens es. (Hear us, o God, in our prayer, for Thou art mighty.) V. Dicamus omnes. R. Domine, miserere. Mass this morning at the church of Saint-Eugène; the Litany of St Martin begins at 1:03:25. The original version of this article was published earlier today on the website of the Schola Sainte-Cécile; translation by Gregory DiPippo.